Good Morning Revolutionaries! We have decided that we are going to take our Revolution to a new level. It has been great the past few months speaking to and sharing with you ways to live a healthier life. We love that you are reading and letting us know about how we have helped. The Revolution Greens Team is now going to step up and get involved. We are going to be the change we want to see. We will start to raise funds for organizations and charities. We will begin with ones that aim at bringing food, water and hope to impoverished communities. We are in the first stages of this new mission and any help or information is always truly appreciated. 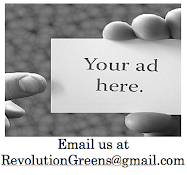 We will begin posting information on the organizations that are making a difference and if you have one you want to see up email us at Revolutiongreens@gmail.com Be a part of the Greater Good! More information coming soon.